The GABS People's Choice awards is the one that carries the most notoriety in Australian craft beer circles. It may not be the most prestigious, but it's one that gets everyone talking. This year the mad beer scientist that is BrewCult's Hendo walked away with the gong for his offering; Milk and Two Sugars. Milk and Two Sugars is an "Imperial Milk Stout" packed with heaps of coffee from Axil Coffee Roasters. It's a beer I sampled on the day and was impressed by in my little (85ml) sample. The true test of any beer though is how it stacks up when you have more of it; and today is that day. So enough talking, let's crack into it! As expected the beer pours a very dark colour with a khaki head. The heads retention isn't too bad but it does fade to barely a rim of foam around the edge of the glass before the end of drinking. This tends to lead me to think that it has relatively low carbonation as I also can't see any bubbles rising to the head. As Milk/Sweet Stouts go though, this looks pretty stock standard. Onto the nose; and you're immediately smashed in the face by a cavalcade of coffee aromas. It's absolute full of the stuff! There's also a light chocolatey element and a mild sweetness, which seems milky. I suppose that would be fitting as it is a milk stout. I detect very little bitterness on the nose, with whatever is there seemingly coming from the roastiness of the coffee. 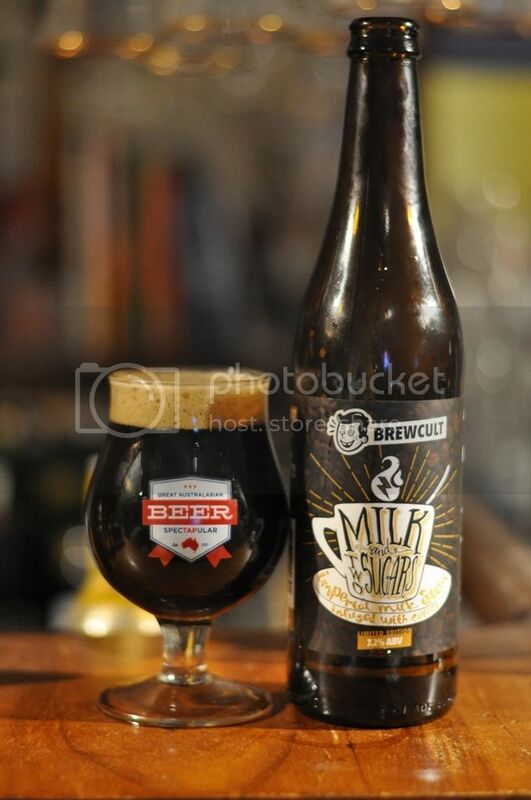 BrewCult's Milk and Two Sugars really is a wonderful beer. As expected there is plenty of coffee and roast flavours; as well as lots of milk sweetness. There's also a fair amount of chocolate there, with barely any noticeable hop bitterness. If you are a fan of a sweetish coffee this is a beer you cannot miss! Over all I think this is a fitting winner of the GABS People's Choice Award for 2015. It's inherent sweetness won't appeal to everybody, but for those who can get passed that you will be rewarded with a terrific beer. This was a little more restrained than some of Hendo's previous GABS offerings but it was no less memorable! Track this down while it's still available.